The tribe Haeterini is confined exclusively to the neotropical region. 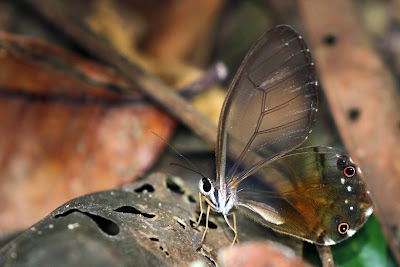 All members of this tribe are elusive crepuscular butterflies which spend their lives skulking deep in the undergrowth. There are 5 genera - Pierella, Pseudohaetera, Cithaerias, Dulcedo and Haetera. All butterflies in the latter 4 genera have rounded transparent wings, with small ocelli at the apex of the hind wings. The genus Haetera comprises of 2 species - macleannania and piera. Both are extremely similar, but macleannania has a reddish flush on the hind wings, while in piera this is amber in color. Haetera macleannania is found from Costa Rica to Colombia, and is replaced further south by piera which is found in Venezuela, Guyana, Surinam, Brazil, Ecuador, Peru and Bolivia This species, in common with all members of the Haeterini, is found only in deeply shaded areas of rain forest. It occurs at altitudes between sea level and about 1500m. ( grasses, palms, bamboos, sedges, rushes etc ). Adult Haetera in my experience are found mostly in the vicinity of bamboos. The larvae are likely to be similar to those of other Satyrines, namely slim, cylindrical, dull greenish or brownish in color, with thin longitudinal stripes along the back and sides, devoid of setae or tubercles, and possessing caudal prongs, and a pair of knob-like projections on the head. The adults are usually encountered in one's and two's. They are denizens of the darkest and dampest recesses of the rain forest, and appear to be very localized. The butterflies are crepuscular in nature - they can sometimes be found in the middle of the day, but are far more often encountered at dusk than at any other time. The butterflies tend to remain deep in the undergrowth, but emerge at dusk to feed at rotting palm fruits on the forest floor, or on fluids exuding from decomposing fungi. They remain stationary for long periods, but are easily put up, and if disturbed retreat into the undergrowth.